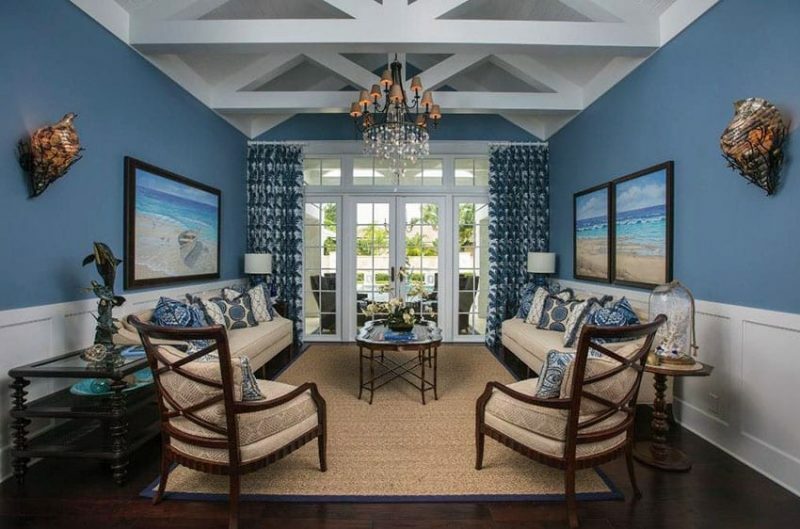 This gallery features blue living room ideas from a variety of design styles. In these pictures you’ll find interior designs using the color blue in creative ways to create an inviting and attractive living space. Blue is used in paint color, decor, accents and furniture to create a serene and calming atmosphere in the home. Built-in bookshelves and cabinetry are typically used with a two-fold purpose: functionally usable storage space and aesthetic space decor. In the photo example above, the built-in storage spaces are painted a bright and bold white and given a simple, geometric shape. 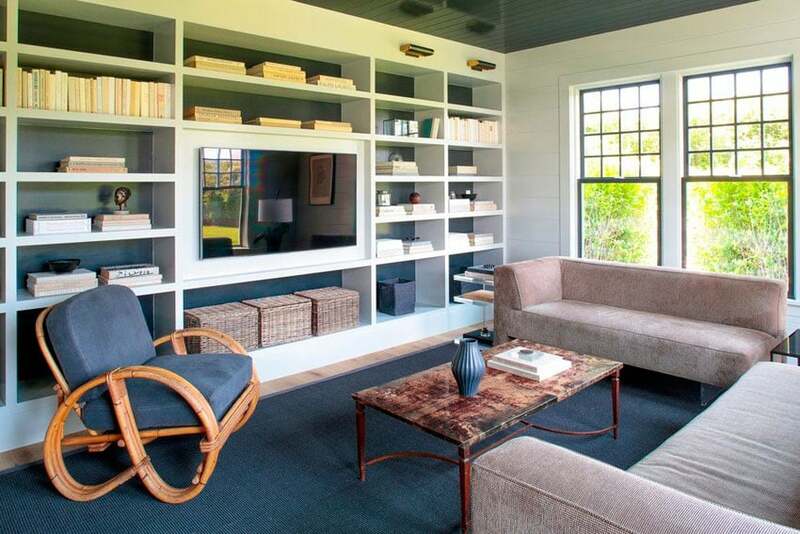 This goes well with the similarly white painted wood-board panel ceiling. The dark hue of the blue walls and a nice contrast to the white elements as well as giving the room a navy-themed ambiance. This motif is also seen in the blue and white rug and navy-themed throw cushions. The wood blinds, stained mahogany wood board flooring, comfortable light tan sectional sofa, and the woven wood-top coffee table all add a good helping of warmth to the space. 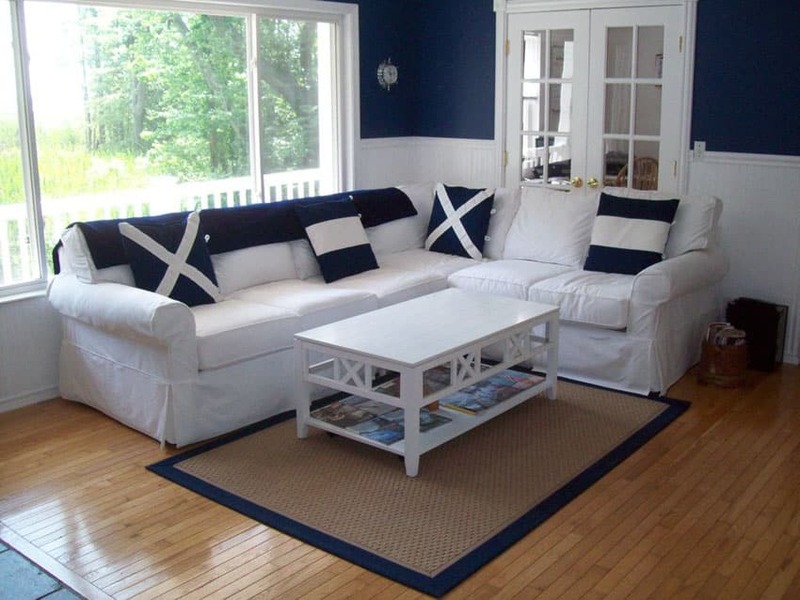 This nautical themed living room looks great with its blue and white color palette. White wainscoting wraps around the room framing the french doors and looks harmonious with the white vaulted ceiling above. Rich hardwood flooring and wood framed furniture are elegant and helps promote the feeling of a coastal ambiance. This modern living room design uses its blue accent wall to frame the picturesque views of the landscape outside, an effect that could be achieved by using such big glass windows. To contrast the brightness of the walls, it employs dark-stained hardwood floors with gloss that reflects the light coming in from the numerous windows. 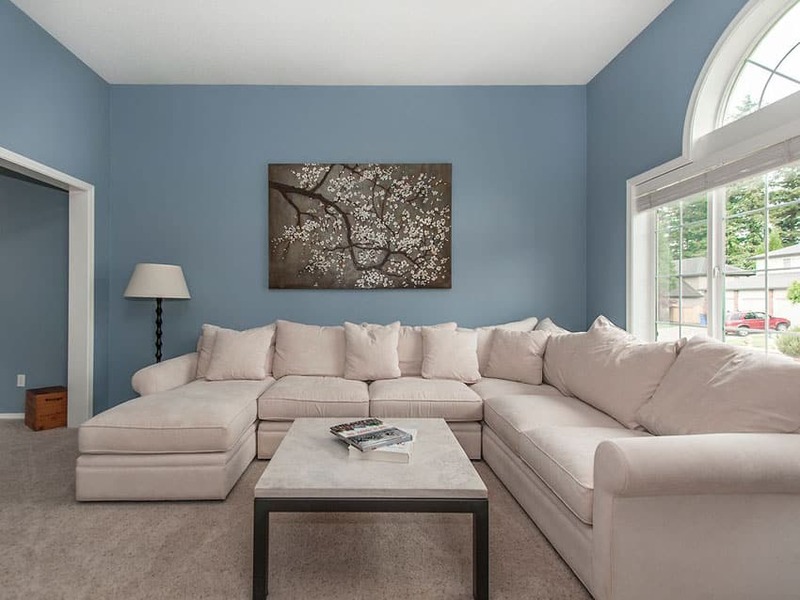 A white leather Lawson-style sectional sofa with playfully colored green and blue throw pillows, minimalist polished stone coffee and side tables, and a light tan shag carpet top off the modern, contemporary look. Creative artistic paintings are smart design elements to any contemporary design. 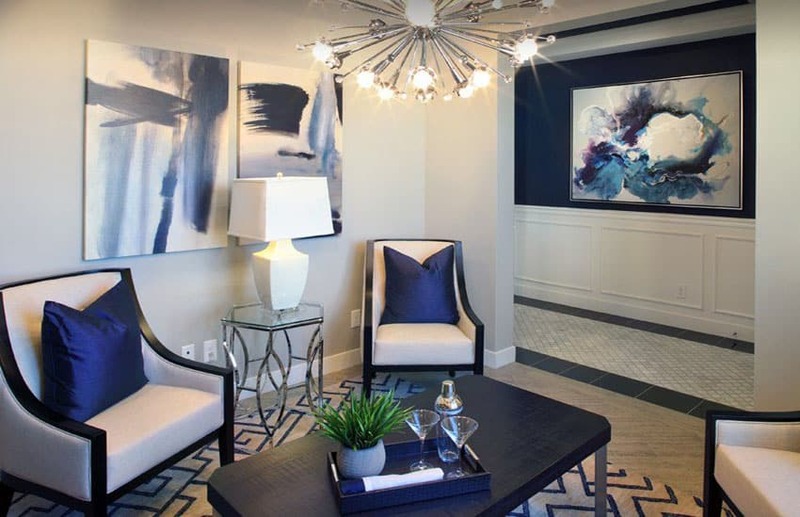 This living room piece employs amazing blue-themed abstract artworks to make the space feel sophisticated and alive. The contemporary furniture pieces only serve to heighten the artistic sense in the room – the strikingly bold modern chandelier, the ornately designed glass and metal side table, the contemporary dark wood framed arm chairs, and the geometric patterns on the rug all go well with the design. The navy blue accent wall, the dark blue satin throw pillows, and the off-white color of the back walls and wainscot, help tie it all together. With a whimsical play on colors this blue and yellow themed contemporary living room makes a big personality statement. It’s hard not to want to have fun and hangout in such a bright and colorful environment. 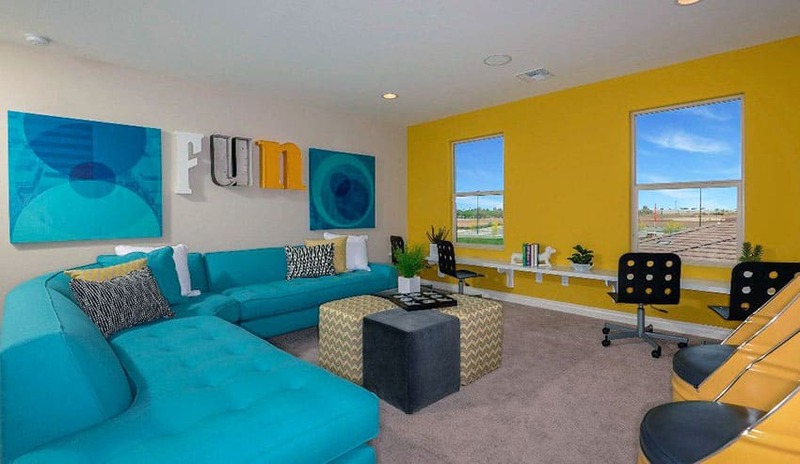 The large aqua blue sectional couch combines with blue artwork on the walls mixes well with the yellow accent wall and yellow retro tub chairs. 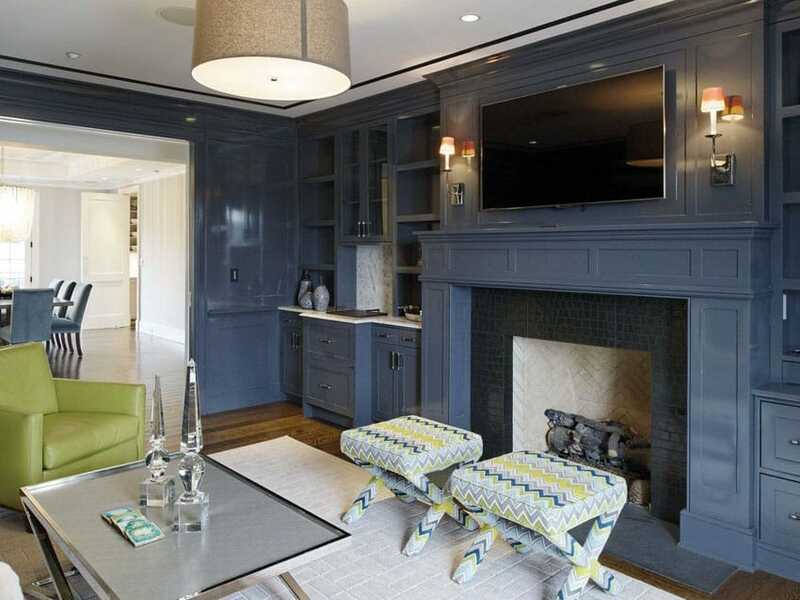 This contemporary piece of design is an eclectic example of using blue hues to define a space. 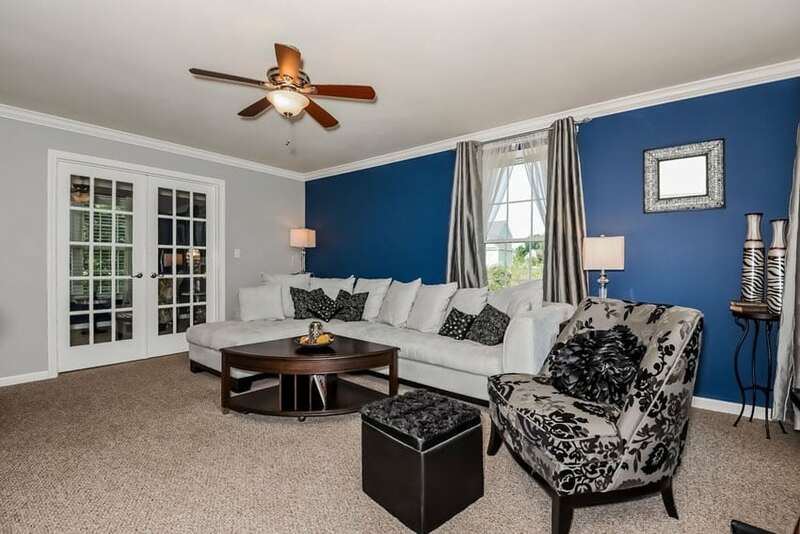 The glossy saturated blue tone on the walls and wainscot keep the room feeling fresh and cozy. The dark oak floor boards also add warmth to the space. The centerpiece of the design, the stone and brick covered wood-burning fireplace, give the room a nice focal point that keeps the design grounded. Finally, the playful contemporary choices in seating – the geometrically patterned stools as well as the green leather accent chair – give the room some personality and life. 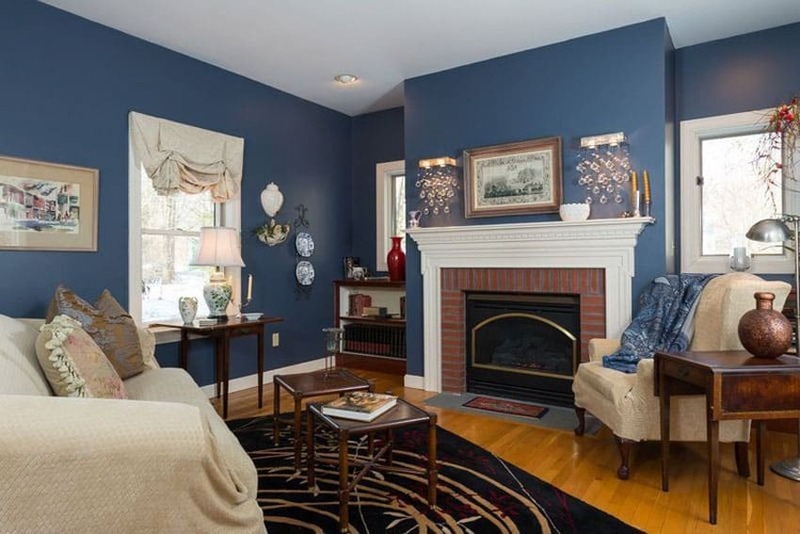 A more traditional approach was used for this blue living room design. It is worth noting the overall effect of using two shades of blues on the walls to really give the room some visual variety while still sticking to the thematic use of blue. The furniture pieces are simple but striking; hints of mid-century modern design can be seen in the three-seater sofa and white and brown striped accent arm chairs, while the sleek design of the glass and metal coffee table gives the room some much-appreciated edginess. The leaf-patterned center rug and the gray ash flooring keeps the space feeling homey and intimate. 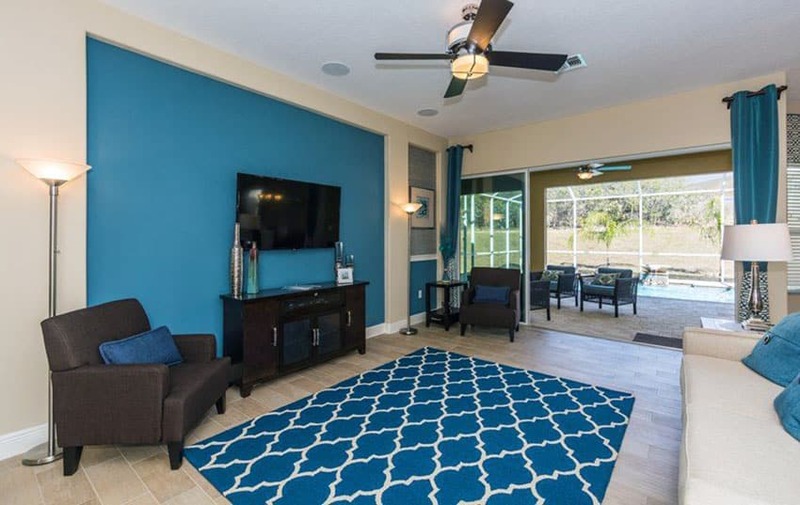 This rooms accent wall, large patterned area rug, furniture pillows and curtains provide plenty of bright blue to lighten and energize this contemporary living room. The accent wall is the main focal point and is painted in a loch blue and surrounded by a stucco color paint. 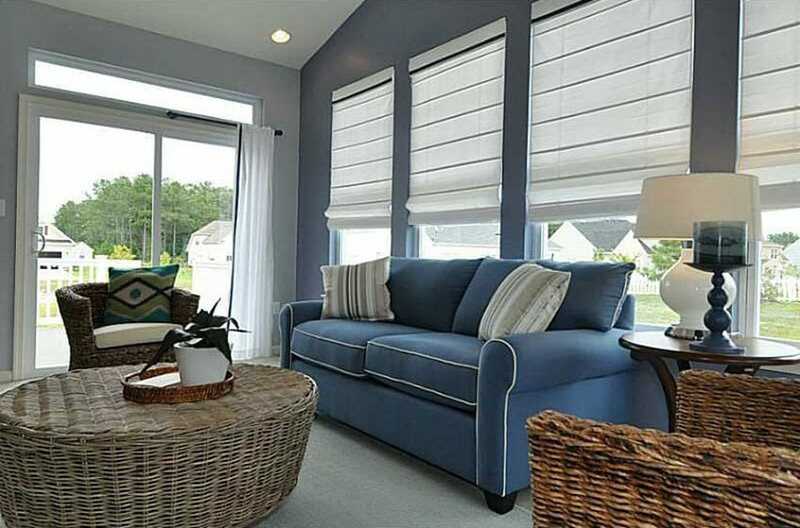 The light color flooring and large open sun-room help provide additional light to the space. Tropical themes appreciate the generous use of blue in their designs. In this example, the striking use of azure in the bamboo-frame arm chair, the saxony carpet, and the subtle back wall behind the built-in bookshelves serve as a good complement to the overall feel of the space. The white built-in shelving uses the books and knick-knacks it stores as intelligent accent pieces that keep the room feeling personalized and interesting. The chaise lounge sofas used go well the distressed wood finish on the coffee table and the aforementioned exotic feel of the bamboo-framed lounge chair. Finally, the wide french windows used do well in giving us a view of the lush greenery found outside. 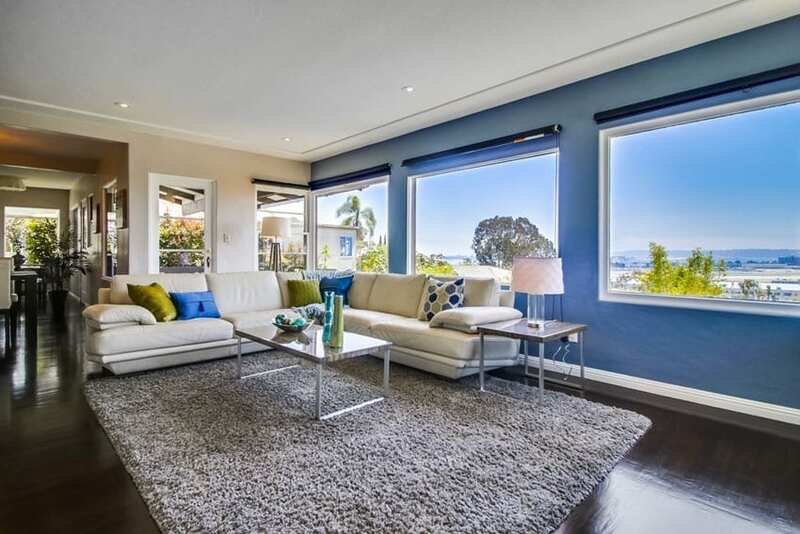 There are an assortment of blue living room ideas in this colorful room. This eclectic piece of design employs a color that has historically gone very well with blue: rose pink. 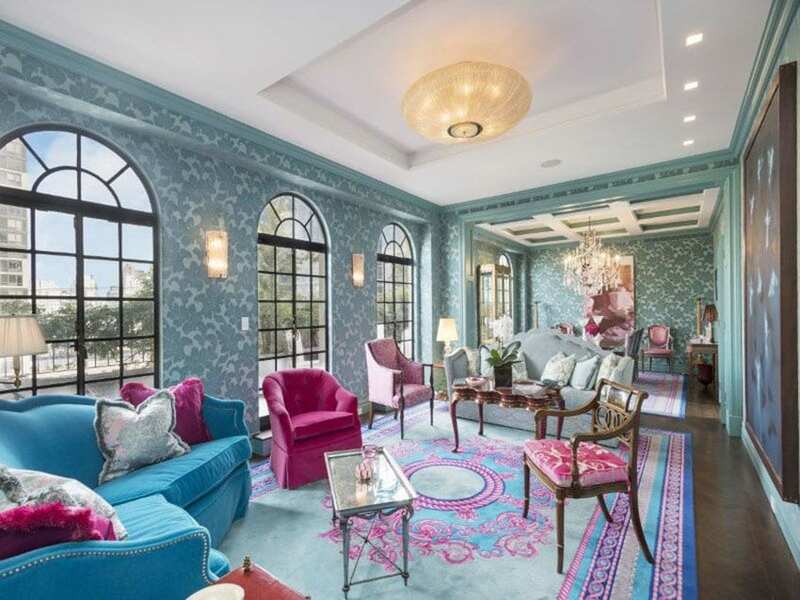 The generous use of both hues can be seen all over the living room – in the charming camel back sofas and throw pillows, the microsuede club chair and upholstered arm chairs, and the brightly patterned blue and pink floor carpets. The arch-top french windows also add to the sophisticated and bright ambiance of the room. To top it all off, the intricate floral and leaf patterns on the blue wallpaper gives even more life to the space, keeping it stylish but also playful. 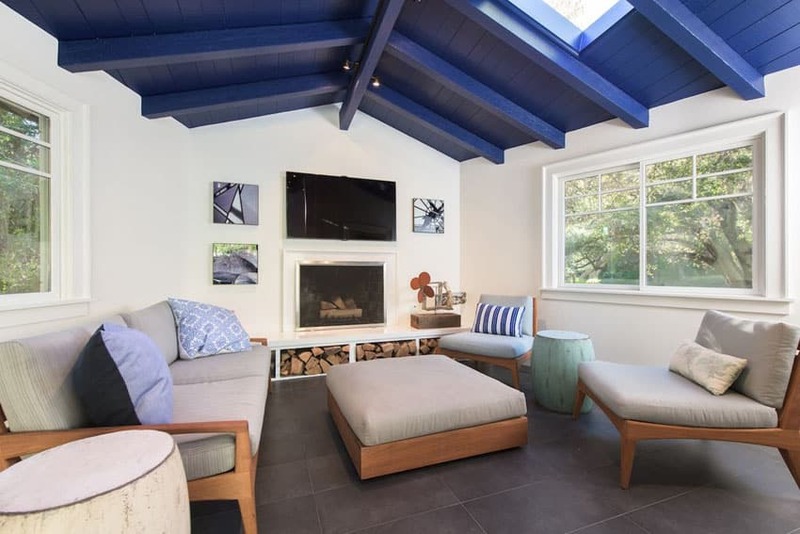 The gable roof ceiling has its wood planks painted a refreshing shade of navy blue. This in itself, coupled with the sun roof, achieves a bright modern feel to this living space. The large windows frame the lush landscaping found outside, further making the room feel open and bright. The furniture pieces – sleek and stylish mid-century modern armchairs, sofa and ottoman – keep the piece feeling clean and relaxing. The wood-burning fireplace, with its log supply kept stylishly exposed on shelves underneath, has a flat screen television mounted on top of it, making the back wall the center of entertainment attention in this space. The large white sectional Lawson-style couch invites guests in with its comfortable and lounge-worthy design. The floor carpeting, granite-top coffee table, and the relaxing hue of light blue used on the walls further makes this space feel like the perfect room to relax in. The large french windows, white trimmings on the window frames and room threshold, and the white painted ceiling, all keep this living room design feeling bright, spacious, and welcoming. The dark blue used on the accent walls of this cottage living room is the perfect partner to the bright white paint used on the wainscot and door and window frames. Along with the glossy white painted wooden coffee table, the white upholstery on the sectional English couch is striking and goes with the theme of the area. Similarly, the throw cushions use block patterns of the same blue and white tones. The rich browns of the teak floor boards and the woven floor rug give this living room the warmth and coziness much needed in personal living spaces. This living room takes advantage of its long and narrow shape to keep itself feeling cozy and intimate. 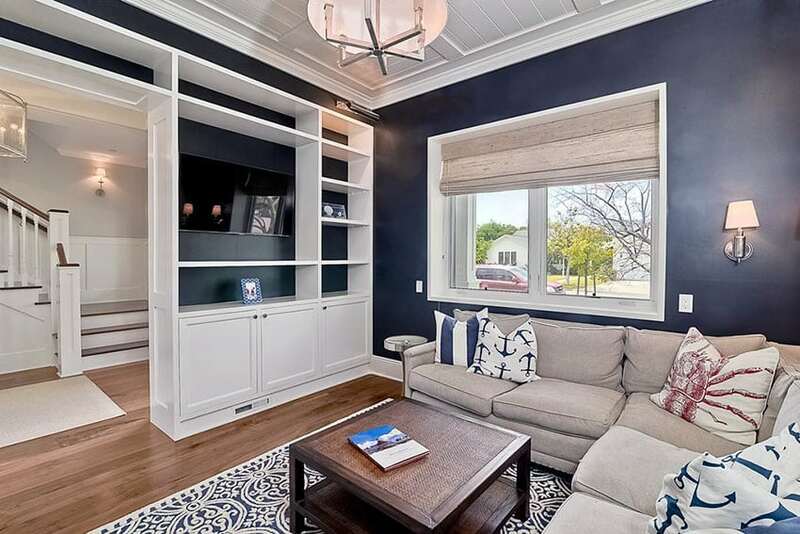 The rich navy blue walls and the whites of the built-in shelves, doors, baseboards, and ceiling go extremely well together. The long and low microsuede lounge couch as well as the playful colors of the striped central ottoman are good additions to the level loop floor carpeting and make the place feel personal and comfortable. Whites are not the only colors that go well with the blue theme; browns are also good partners for azures and, in cases like this one, also give the room a dash of elegance and class. The wooden coffered ceiling and wood parquet flooring, as well as the wooden side tables and display shelves, keep the room feeling warm and stylish. The central stone fireplace coupled with the elegant faux-candle hung chandelier are good central focal points for the design; they keep the ambiance of the place feeling bright and sophisticated. The furniture pieces are also interesting to note; the dark brown leather loveseat and the bright red tufted lounge chairs are welcome additions to this kind of design style. 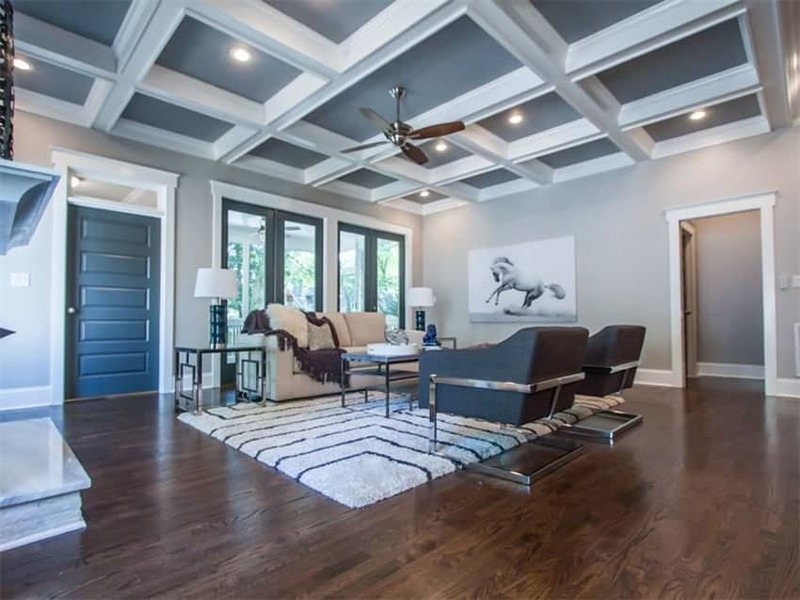 The white and blue-gray coffered ceiling is the main source of blues in this example of living room interior design. Select design elements, such as the panel front door and the cantilever lounge chairs, also carry the blue motif with different hues of the said color. Overall, the contemporary design style of this living room is pleasantly offset by the warmth of the red oak floorboards, the white and black geometric-pattern rug, and the mid-century modern style couch. For personal-use spaces with high ceilings, it is good practice to segment the visual height by adding elements that break the height of the wall; this keeps the place feeling properly proportioned and appropriately intimate. In this example, there are two running sets of windows separated by a band of wall between them, as opposed to having one set of full-length windows. The dark blue of the box style ceiling also helps in keeping the ceiling from feeling too high up. 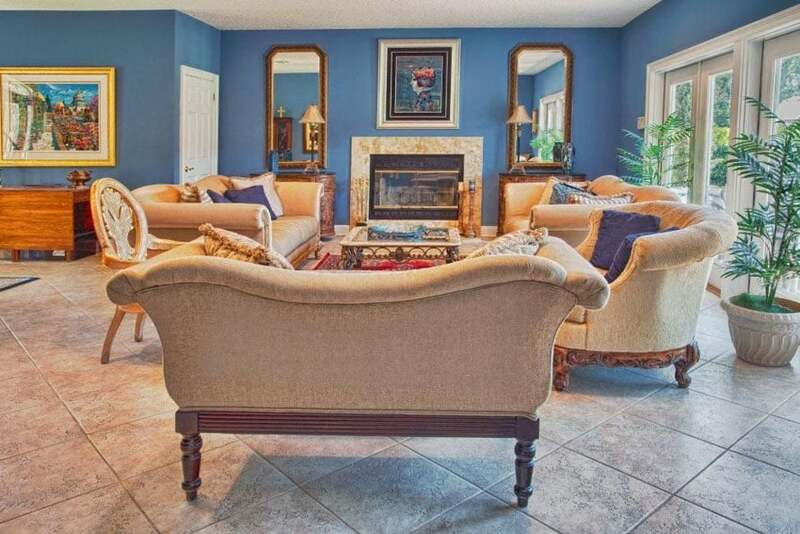 The stone tile on the central wall houses the fireplace and main entertainment center. The gray carpet goes well with the modern and eclectic furniture choices seen in the Lawson-style sofa, floral-patterned club lounge chairs, and striped-patterned ottoman. 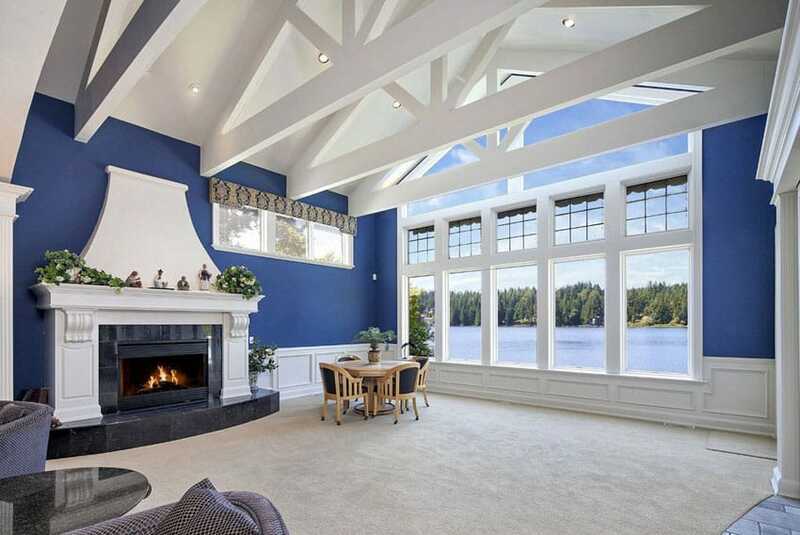 The high vaulted ceilings is an eye-catching element of this design; the exposed trusses and ceiling cladding for this gable-roofed space are painted a bright white to contrast the rich navy blues of the walls. 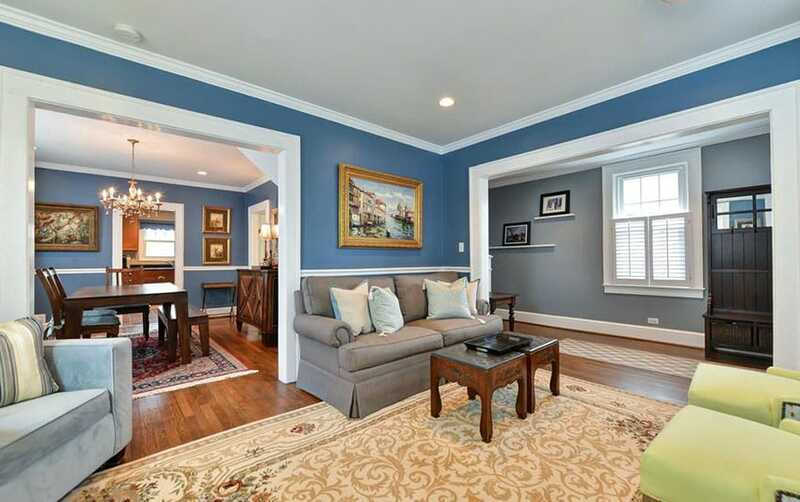 The carpet flooring, wainscot, and fireplace are also appropriately colored white. Wide windows of different varieties were used to provide picturesque vistas of the lake and forest in the background. The minimal use of furniture also gives the space sufficient spaciousness and flexibility. Some of the most popular blue living room ideas come from playing with accent walls and multi-color rooms. This traditional design for an intimate and cozy blue living room is a good example of using intricate black patterns to give some character to a space. 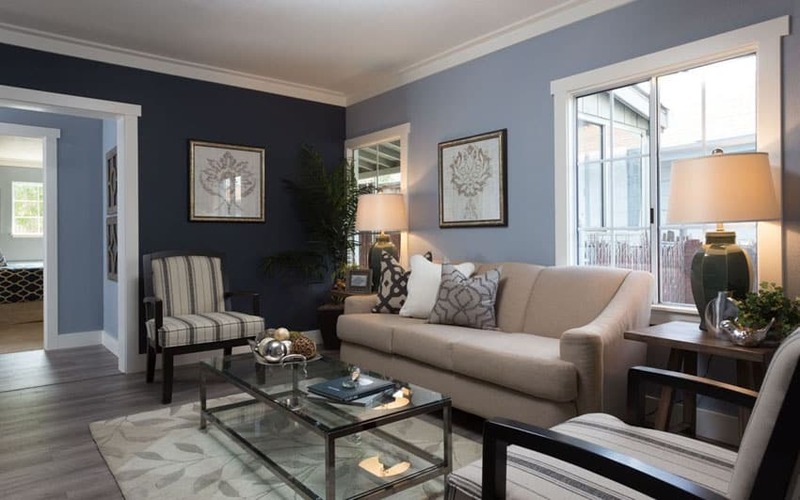 The accent blue wall benefits from the black patterns on select throw pillows on the white sectional couch, the black floral pattern on the upholstered lounge chair, and the black stripes of the decor vases on the side table. The carpet flooring, french doors and windows, contemporary quarter-circle wood coffee table, and warm-lit ceiling fan give the room a steady mix of sophistication and intimacy. Blue is often used to keep a place feeling new and refreshed. 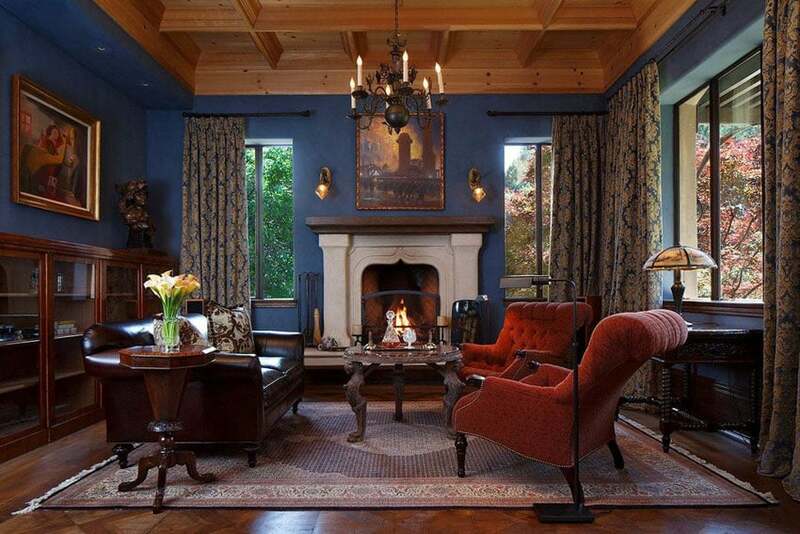 In this example, the brick fireplace and teak floor boards, in addition to the wide use of wooden side tables, give a cozy warmth that is also kept refreshing by the painted blue walls.The varied design styles of the furnishings and decors keep up that contrast of refreshing contemporary coupled with warm traditional design. Crown moldings and door frames are used in practice to frame the walls and ceilings of a room. Using contrasting white frames on blue and gray painted walls achieves an affect that essentially keeps the room feeling usable and personal. The mahogany floors, floral patterned floor rug, and wooden furniture are nice additions to the mix. The loveseat sofa, microsuede side couch, and green lounge chairs also give the space some personality. 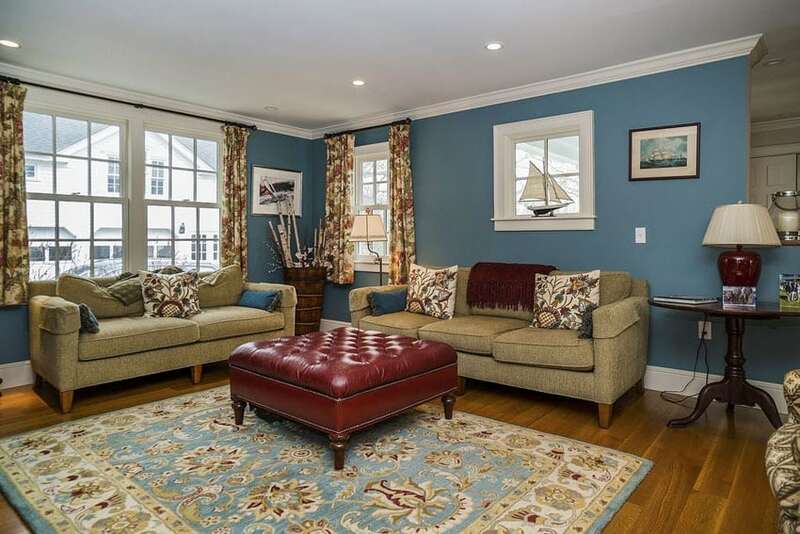 The navy walls and hardwood floors of this living room design go exceedingly well with the olive green mid-century modern sofas and floral patterns seen all over the room – in the curtains of the french windows, in the throw cushions of the couches, and in the central floor rug used. The red leather tufted ottoman is the center piece of this living room design, its bold, rich velvet red contrasting with the greens and blues of the rest of the space. 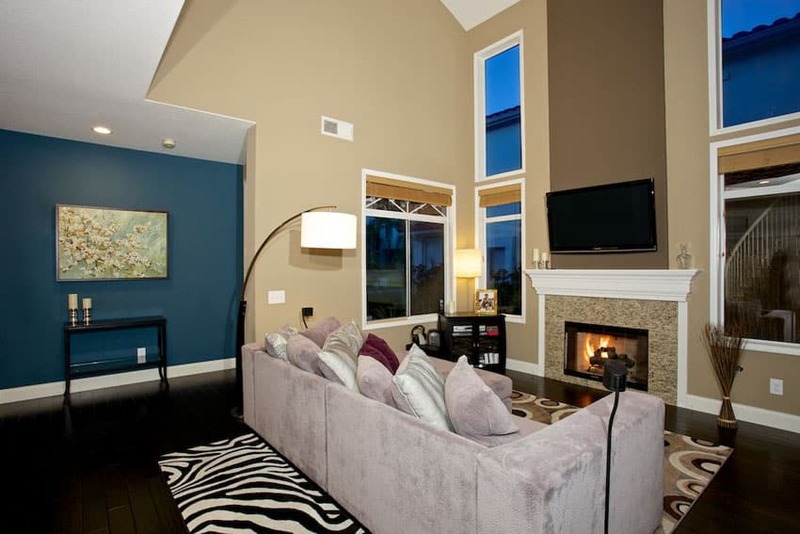 This living room, with its selection of design elements and contrast, feels alive and stylish. Wicker furniture goes extremely well with blue colored living rooms, further cementing the navy motif that is commonly used for these spaces. 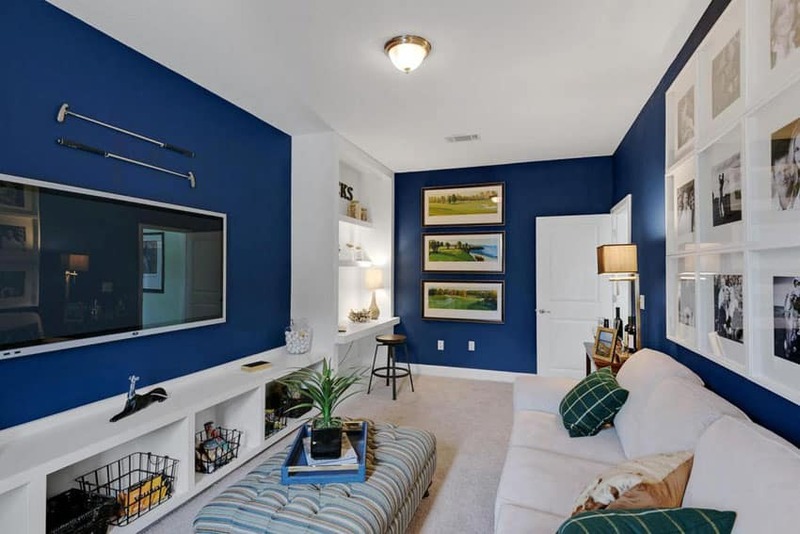 The blue Lawson-style sofa complements the navy accent wall. The light gray carpet flooring, the large sliding doors, the tall windows that line up the accent wall – these all contribute to keeping the space feeling spacious and bright. 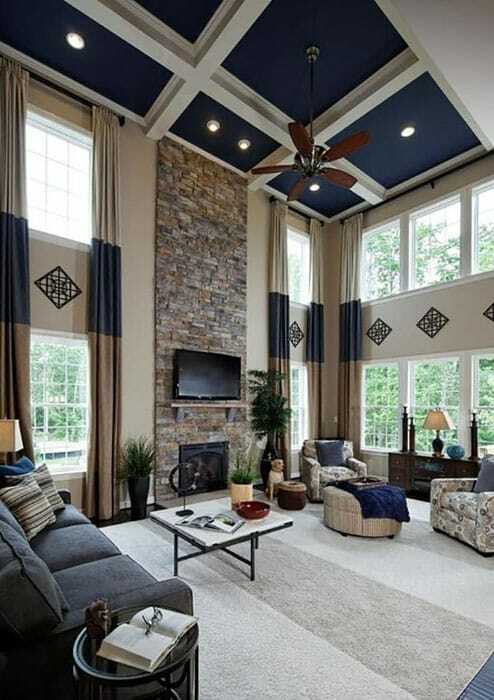 High ceilings in living room spaces keep an area feeling fresh and open. The use of a blue accent wall on the far end of this room as a contrast to the usage of beige and brown on the main walls helps break visual monotony but still maintains the harmony of the design elements in the space. The use of dark wooden floor boards, a subtle flushed wood-burning fireplace, a light mauve microsuede modern couch, and interesting rug patterns gives the space life and personality. In some cases of interior design, the use of different types of colors and hues are done to keep the space feeling adventurous but still stylish. To pull off such a design choice, the use of grounding or default colors is usually imperative to keep the space from feeling too cluttered. In this example, the grounding color is a rich, vibrant blue painted on the walls of the space. Elsewhere, different shades of beige, brown, red, and green are used to achieve the aforementioned colorful effect. The choice of camel back and English sofas, barrel lounge chairs, marble fireplace, and travertine floor tiles keep the room feeling high end and sophisticated. The large view doors to the outside and the wall mirrors make the room feel more open and spacious. This traditional living room was tastefully and carefully designed to achieve a classic and sophisticated feel. 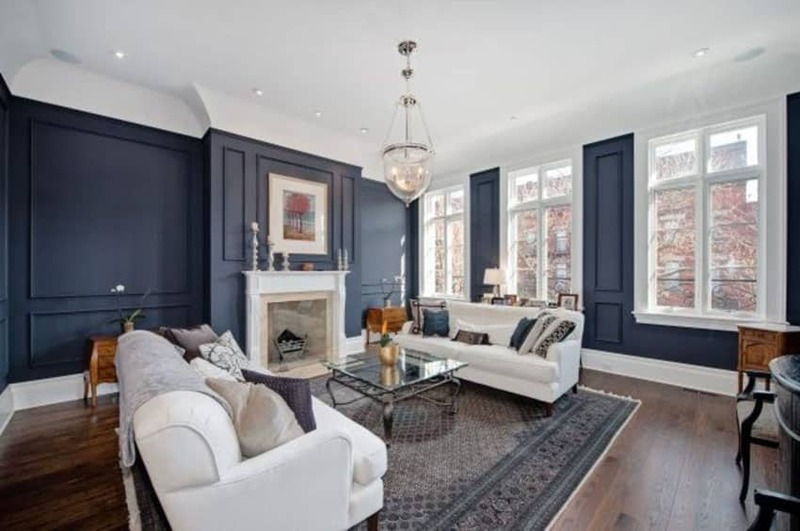 The dark hues of the blue paint on the walls was an intelligent choice to keep the room feeling rightfully elegant; the whites of the leather English sofas, stone fireplace, cove ceiling, baseboards, and window frames keep the place from feeling too dark. The rich dark stain on the oak flooring and the subtle use of solid wood furniture also add to the warmth of the area. Lastly, the use of a glass coffee table and the contemporary glass chandelier further adds style to the room.